The great Mughal ruler shah jahan constructed three most beautiful and fabulous buildings in his time which are the great Taj mahal, Red fort of India and the Jama masjid (mosque) of Delhi. It is the biggest mosque of India where 25,000 people can sit together. The first brick of the mosque was laid in 1644 and had been completed in 1656 and it brought a cost of 1 million rupees of that time. The mosque had been constructed with three big gates as to the north, south and the east and tall towers which are four in number, all are adding to the beauty. Beside all this the jama masjid is having two great minars with a height of 40 meter each. 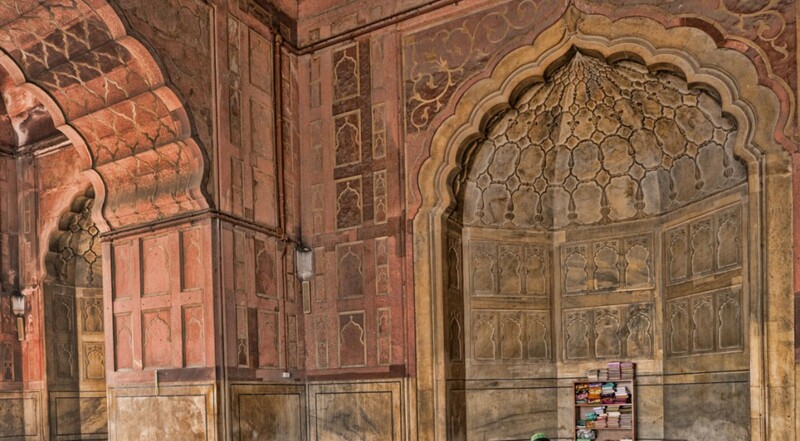 The whole building is made with marble and the red stone just like other Mughal constructions. Behind the minars the mosque is having big domes which connect it to the famous Muslim Art and way of construction. The floor has been marked with black borders having a number of more than 890 for the prayer offering. The corridors and the balconies are all decorated with calligraphy. Entirely the whole mosque resembles to the great Badshahi masjid based in Lahore Pakistan. During the British rule on India the jama masjid was said to be destroyed but that did not take place as its functions was changed to the soldier’s station of British army. It faced two serious situations in 2006 and 2010 as a terrorist attack and a gun fire. In 2006 some parts of the mosque were repaired. The jama masjid of India is now one of the center points of the Muslims. Beside being a religious spot the jama masjid is also enjoying the role of a being an ancient point and a famous tourist hub receiving hundreds of tourists from worldwide.